You don't have to be physically fit, slim or supple to benefit from practising yoga. Find out how you can get started from home whatever your size right away and not suffer embarrassment or ridicule for trying to improve your self! Whatever life choices you may have made that has resulted in you being the physical size and shape you are right now, you can change it by making a decision to change yourself. Don't ever be fooled into thinking that "As I am so shall I be." We all have the ability to change and so do you! While all the motivational quotations and anecdotes in the world may be nice to hear, they can still have little effect on us if we don't believe deep down that we can embrace the messages that we're hearing. That's probably the reason you feel as if you can't allow yourself to try something different in case it doesn't work and you fear failure. Don't beat yourself up, you're not alone! Many of us get caught up in that kind of situation where we have become so accustomed to the way we are, we just don't believe anymore that we can change it for the better. Perhaps we fear that failure that not only affects us directly, but can be seen in the eyes of those we know and even some of the people that we love. Our family, friends and loved ones all mean well, but we still worry and fret that if we dare to get outside our comfort zone and try something that might help us improve in some way, those people might not give us the approval we crave, or we feel they may be waiting to laugh at us if we fail. So we avoid setting ourselves up for a fall, even if we will probably get great support from the people around us, because we can't be sure of it. And that's what stops so many people doing something they wouldn't ordinarily do. If you are a plus size, overweight or even obese and have tried countless diets and other mainstream ways of losing weight but always failed somewhere along the way, your self esteem is probably low. You might even feel you can't do anything about your size, so you just live with it. That's right. Did you ever stop to consider that the idea that you should lose weight may be the very thing that is keeping you overweight! Not a lot of people know this and maybe you don't either, but we are hardwired to go looking for something we lose. If it's weight you lost, guess what your body is programmed to do? Go find what it lost and get it back! So if you ever wondered why it is you could lose weight through a diet but then put it all back some time later, there's your answer! Plenty. By making the decision that you should try yoga as a form of physical improvement, you don't have to view it as a means of losing weight or getting fit. Those viewpoints are probably going to stop you from even trying it. So don't look at it from that viewpoint. Instead, look at yoga as a means of improving yourself mentally and spiritually by learning to relax, se-stress and simply enjoy yourself more. Nothing else. Once you change your perspective of what yoga can do for you, you might be pleasantly surprised at how it can really help you to boost your self esteem and confidence. When those things get a lift, you'll find other areas of your life rise up along with them. Practising yoga no matter what size you are is not just possible, it is very doable and enjoyable, even during pregnancy. It's easy to get started and you can take it at your own pace, whatever is comfortable for you. If you have never heard of Yogasteya before, that's not surprising. Many people don't know what it is. So here's introducing a potentially life changing idea for beginners no matter what your physical size may be. Most people's perception of yoga is attending classes with other people and all sitting on mats in a room with an instructor showing you how to breathe deeply and contort your body into unnatural positions! There are some things wrong with that perception, but maybe you might be put off simply by having to get public with your size and shape or worry about looking stupid in front of strangers. Well, there is an alternative that you can do at home if you want. That way you don't have the worry of experiencing the feeling that other people are judging you, even if they're not. You can just get on and follow the instructional program at your own pace in the privacy of your own home at times when you can be alone and uninterrupted. Want to Try Yogasteya For Yourself? I won't try to butter this up any, as it is a membership website-based program that you will have to pay for the service. It's not expensive, but I understand not everyone can afford to commit to a monthly fee. Well, there is some free stuff available online via Youtube for sure, but just be aware that most videos put up there are promotional and may only show you snippets of what you need before trying to sell you on all kinds of programs. So not everything that looks free is really free! 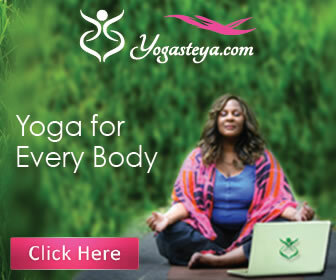 Yogasteya is not free either, but what you get is 24/7 access to yoga videos and instructional material provided by a qualified yoga instructor that is all geared up for plus size folks and those with varying physical abilities. And it's pretty good! I'm going to shamelessly promote it with one of their own advertisements below and ask you to click your mouse on it to open the official Yogastea website. You can take a look for yourself and see if it's what can be good for you. If it is, then by all means go ahead and sign up. They even offer a trial package for just $4.95 for the first month! After that it's still very affordable at only $9.25 a month after that and you can cancel anytime you feel you've gotten all that you can from it. If you don't think it's for you, then of course you don't have to sign up if you don't want to!